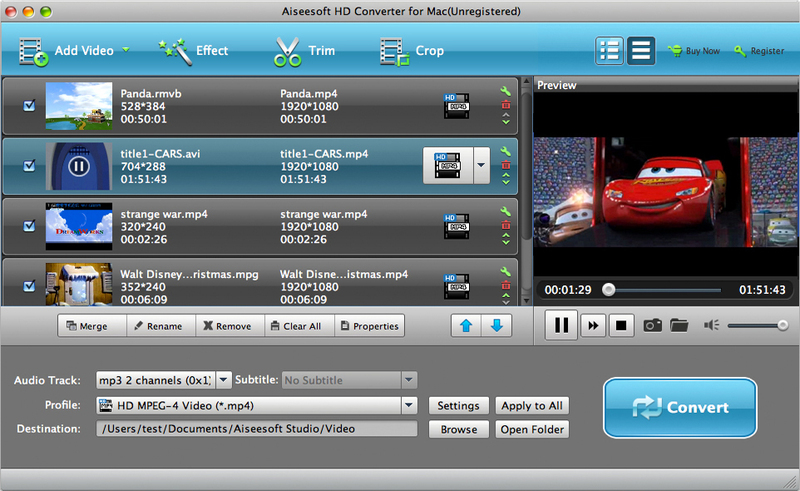 Professional HD Converter for Mac can convert video to HD video HD / SD adequate. It also allows you to change the original SD video to HD video. HD conversion program supports almost all HD formats like AVCHD (MTS, M2TS), HD TS, HD MPEG, HD WMV, HD MPG, HD MP4, QuickTime HD MOV, HD H.264, HD RM video, etc. You can easily change the format of an HD video for better compatibility with your media player, portable device or editing software. Besides converting HD video, this HD Video Converter for Mac is the best solution for converting audio files. You can freely change the aspect ratio between overall audio and lossless audio. It also allows you to extract audio files from HD video. Once you have converted your video files to audio, it will be possible to enjoy anywhere and anytime you want. The application allows you to convert HD videos to any file general / audio lossless commonly used, such as MP3, AAC, AC3, AIFF, FLAC, WAV, WMA, etc. This Mac HD Converter has multiple editing functions that allow you to customize the output video and audio effects. You can adjust the brightness, contrast, saturation and volume of HD / SD video to meet your satisfaction. In addition, you can set the audio volume. Also, you can trim the video to remove the unnecessary part of the video that best fit your player, and crop video, join segments and add personal water marks. And you can easily bring a 3D effect to video output.